There have been several reports that OnePlus is considering moving the fingerprint scanner on the back and this will also allow OnePlus to implement the 18:9 6" display with 2160 x 1080p to the front. Until now, we haven't seen the exact design of OnePlus 5T, but this is going to change today, thanks to weibo leak. 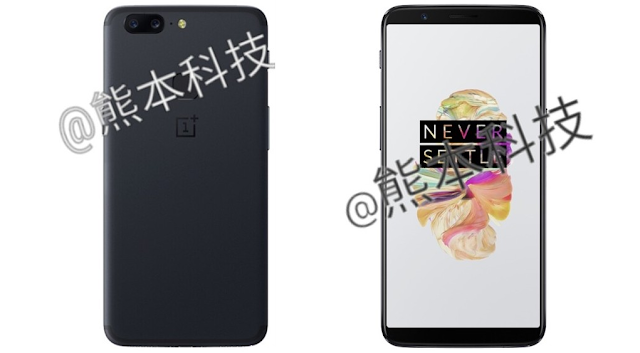 As you can see in the below image, the OnePlus 5T resembles the OnePlus 5 in terms of curves and camera design. The fingerprint sensor is now moved to the rear in favor gorgeous Full-Vision Display. OnePlus 5T is expected to feature the Snapdragon 835 Processor, 6/8GB RAM, and 64/128 GB Internal storage.